15 AMAZING Kurtis You Won’t Believe Are For Less Than Rs 500! If there is one single clothing item that can be found in every Indian girl's wardrobe, it’s our very own kurtas and kurtis. After all, they are so comfortable and available in so many different designs that we can never get enough of them, can we? So, here we are, with 15 colourful and super pretty kurtis for you, all under Rs 500 that you’ll *LOVE*! Trust us, ladies, they are so stunning that you’ll want them all! If you are a girl who loves bright colours, you will definitely want this pretty fuchsia kurti. It will look great when paired with ripped jeans or a salwar in a contrasting colour. Price: Rs 399. Buy it here. This super pretty yellow kurti has stolen our hearts. It features cute tassel details on the neckline and printed detail on the sleeves. Pair it with an off white palazzo for a simple, elegant look. Price: Rs 490. Buy it here. We fell in love the moment we laid our eyes on this pretty black kurti. It is perfect for days when you are stuck in a fashion rut. Just pair it with a jeans or palazzos and you’ll be sorted for the day. Price: Rs 490. Buy it here. For days when you want to stand out without going OTT, this kurti should be your choice. It features a very rich purple colour and will definitely make you look very vibrant. Price: Rs 450. Buy it here. This simple white printed kurti is so pretty that we want it right away. It can be the perfect outfit choice for college as well as for office. Just pair it with ripped jeans and juttis and you’ll be good to go! Pair this pretty burgundy with a Patiala for a simple yet cute look. We absolutely love the sleeveless design and embroidery on the neckline. Price: Rs 349. Buy it here. 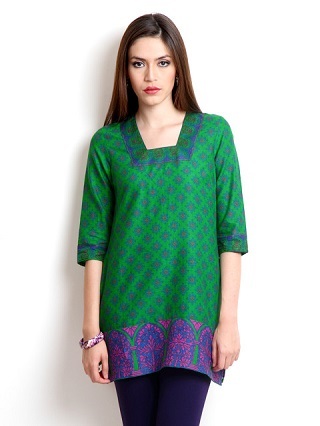 If you are a college girl, then this printed green kurti is definitely one you need in your wardrobe. Pair it with pants or jeans to stay comfortable and look great all day long! Price: Rs 419. Buy it here. We can never have enough of black, can we? This one with a simple printed yoke has bowled us over. It’s just too pretty to not buy! Price: Rs 480. Buy it here. Look like a diva in this pretty pink kurti with printed details all over. Pair it with a salwar for a simple, yet stunning look. Price: Rs 399. Buy it here. If you love prints, then this blue printed kurti should definitely be on your ‘must-buy’ list. Wear it with blue denims and kolhapuris to rock a casual look! This multicoloured kurti is so gorgeous that we want it right away. Just look at the bright colours, we can never get enough of this prettiness! Price: Rs 399. Buy it here. Simple yet stunning, this peach kurti is just SO pretty! Pair it with salwar or palazzos and a pair of silver earrings for a perfect ethnic look. Price: Rs 349. Buy it here. Love brights? We’ve got you covered one more time. This bright magenta kurti will be your ‘forever love’ for a very long time. It’s just so pretty that you can even wear it to a wedding too - or, at least a fancy function!! Price: Rs 499. Buy it here. Are you a fan of lehariya prints? You can thank us later as we got you this stunning beauty that you will cherish. Just pair it with Patiala salwar and juttis for a gorgeous look. Price: Rs 479. Buy it here. 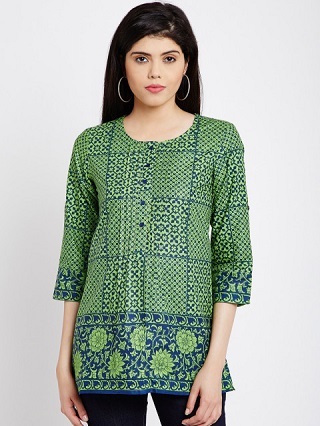 Look gorgeous in the ‘colour of the year’ with this green kurti which is the best we have seen today. It’s so simple yet classy, you will fall in love too - just like we did! Price: Rs 455. Buy it here. Happy shopping, ladies!